This is a first for PMT. We have never before reported on two cases together. However, this is a special circumstance as these cases read together are “game changers” when it comes to loss transfer. Two recent Court of Appeals decisions underscore the primacy of contractual language (or a lack thereof) over appeals to the “reasonable expectations” of a contracting party. The decisions signaled the Court’s faithfulness to principles of contractual interpretation, including the proposition that contracts should not be judicially re-written when their terms are plain and unambiguous. Of course, where the majorities used interpretation to find clarity, the dissents detected ambiguity and/or issues of fact. The dissents also charged the majorities with narrow readings that undermined the intent and expectations of the parties. The decisions share another important similarity: they are the culmination of litigations involving a complex construction project, contracts, and insurance arrangements, fields that are not shy to conflict but also yearn for the opposite. In view of the foregoing, it is an opportune moment to think comparatively about the Court’s decisions and to assess their impact. With Whom Have You Bargained? “WHO IS AN INSURED (Section II) is amended to include as an insured any person or organization with whom you have agreed to add as an additional insured by written contract but only with respect to liability arising out of your operations or premises owned by or rented to you.” (Emphasis added). Liberty denied Gilbane JV’s tender. Gilbane JV brought a declaratory judgment action seeking coverage under the Liberty Policy and so began the saga of Gilbane v. St. Paul Fire, a litigation that centers on competing interpretations of the word “with” and the phrase “with whom”. Liberty argued that (1) the additional insured endorsement is plain and unambiguous ; and (2) a prerequisite for additional insured status under its policy was that the insured, Samson, have a written contract with Gilbane JV. Gilbane JV argued that (1) the endorsement is ambiguous, thereby requiring that it be construed against the drafter, Liberty; and (2) extrinsic evidence, including the contract and sample certificate of insurance, made it such that Gilbane JV reasonably expected to be afforded coverage under the Liberty policy. The more one reads the endorsement, the more it appears, as the dissent puts it, “awkward and unclear.” According to the dissent, the endorsement is subject to divergent but reasonable constructions which rendered it ambiguous. The dissent was swayed by Gilbane JV’s argument that the phrase “by written contract” modifies “to add,” entailing no privity requirement. Dormitory Authority v. Samson concerned the same project as Gilbane v. St. Paul Fire. In Dormitory Authority, DASNY and the City of New York sued Samson and Perkins under breach of contract and negligence causes of action, alleging that defendants failed to properly design and install an excavation support system which caused substantial property damage. DASNY and Perkins entered into a contract for Perkins to provide design, architectural, and engineering services for the project. DASNY entered into a separate contract with Samson for the performance of foundation and excavation work. The City alleged that it was a third-party beneficiary under the contracts, and therefore entitled to contractual indemnification. While the DASNY-Perkins contract certainly benefitted the City – the Contract involved the construction of a medical laboratory for the Office of the Chief Medical Examiner’s use – neither of the grounds set forth in Fourth Ocean were satisfied: (1) the City was not the only party who could recover under the DASNY-Perkins Contract; and (2) the DASNY-Perkins contract did not expressly name the City as an intended third-party beneficiary. For these reasons, the Court held that the City may not recover as a third-party beneficiary. Justice Rivera’s dissent noted that the majority’s reliance upon Fourth Ocean was misplaced insofar as it comes “perilously close to requiring that a contract expressly name a nonparty as a third-party beneficiary.” According to the Rivera dissent: where a third-party is “not a stranger to the contract,” in that its relationship with the contracting parties shows that the third-party is an intended beneficiary, then a “functional equivalent of privity” exists – i.e. the third-party may assert a breach of contract claim. The concept of a “functional equivalent of privity” depends upon a case-specific analysis of the parties’ relationship, rather than an in vacuo application of rules. Both the DASNY-Perkins contract and the relationship of DASNY and the City indicated that the City was an intended beneficiary of the project work. As argued by the dissent, at minimum, these indicia should have been sufficient to raise an issue of fact. Dormitory Authority and Gilbane offer important lessons that go beyond construction litigation. First, the Court resisted calls to look beyond the four-corners of the respective insurance policies and contracts. Specifically, the Court refused to look at the extra-contractual context defining the parties’ relationships as a means of defining those parties’ contractual rights. This is not surprising given the limited role of extrinsic evidence in contractual interpretation. Second, in the case of Gilbane, (1) even with a poorly written endorsement, and (2) where a party made a convincing showing of an alternative reading of the endorsement, a determination of ambiguity is hard to achieve. Third, the Court offered contracting parties a clear invitation: fashion contracts so that third-party recovery or additional insured status is unequivocal. In the case of Dormitory Authority, this means including unambiguous language identifying a third-party beneficiary and specifying that it has a right to assert a breach of contract claim. With Gilbane, it is imperative to subject additional insured endorsements to careful scrutiny to ensure they accomplish their intended aims. 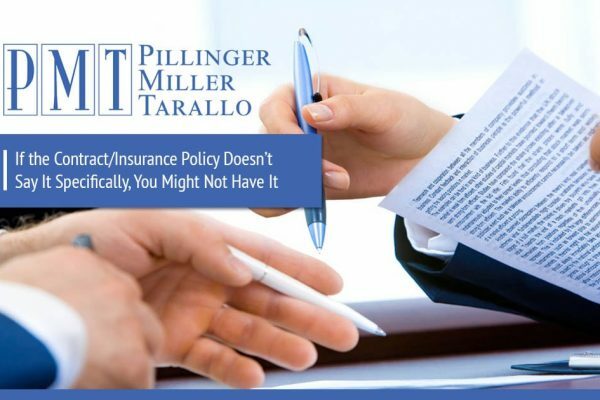 These cases clearly change what was the “standard in the industry” and the “expectations of the parties.” We suggest that you review your contracts and insurance policies to make sure you have the necessary coverage and contractual protections. If you have any question, please contact Marc Pillinger and Jeffrey Miller at [email protected] and [email protected]. The latter potion of Dormitory Authority v. Samson also addresses the recurring issue of a party’s ability to simultaneously maintain breach of contract and negligence causes of action. The dissent points to the following: (1) “the contract expressly states that a city agency will operate the DNA laboratory, and the City retained control over various aspects of the project…”; (2) DASNY is a public benefit corporation whose named governmental client is the City; (3) Perkins was aware of the intended use of the laboratory and the relationship between DASNY and the City.